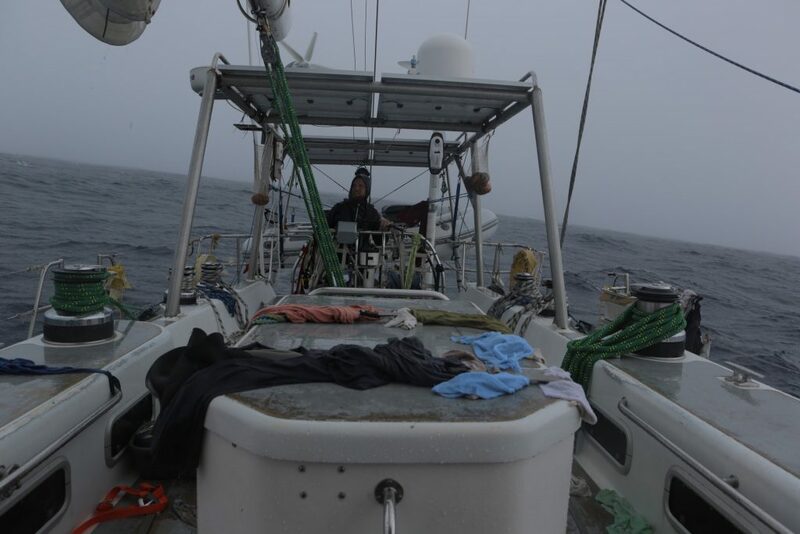 We have been slowly sailing south all day with the tri sail under heavy wind and high seas. After this low pressure system passes, more are forecasted. Today we had an open discussion about the limitation of the swim, the challenges we are facing, the many constraints we have to deal with and what it all meant for the expedition. I knew everybody’s position; they felt we had reached a point where going further would mean compromising our safety. I was the only one willing to go further and challenge the limits. I have a different approach, mind set and goals when it comes to the expedition. For me the expedition is also an opportunity to discover myself, my limits and to challenge them. I set my mind to reaching a certain goal, face the difficulties as they come, reassess my attitude and adapt it to the changes, and learn about my own limitations and artificial barriers that are ingrained in me. The only way to discover more about oneself is to live through challenging events. This is for me one important aspect of the swim and this unfortunately I can no longer pursue. The other important goal and the one that everybody is aligned with is the mission of The Swim; bringing attention to ocean health, focusing on the marine plastic pollution and inspiring people to reduce their use of plastic. This goal has not changed, for me now it is my only focus. Today, The Swim as a world record attempt as stopped but The Swim as a platform keeps on living because it has always been the most important goal of the expedition. Swimming is for me not only a mode of expression but also a unique way to open a window into this amazing world. I feel the ocean not by standing on a beach, or on the deck of a boat, nor by floating, but rather by being submerged in it. I experience its state and mood, and spend countless hours looking down to its depth sharing that magic and disturbed space with its wild life and virus, the plastic that compromises its health. I keep on swimming when and where ever possible to share this deep felt connection I have with the ocean. Get home safe, you guys persevered and tried your best. Nothing you can do about the weather. See you guys safely home. Safety has to come first… and as you said, this [your achievement] is a platform that you can continue to build on. Fantastic effort with a great purpose: well done! Valiant attempt Ben; but, agree that when confronted with the realization of a dream slipping away one must check the “ego” at the front door – using that term lightly here. Sometimes stuff just happens and there’s nothing you can do about it. Safety of the ship and crew takes precedence over everything else. Frankly, I thought attempting to swim the Northern Pacific during the fall/winter storm season was an extreme stretch – but you’ve got to take away the positives here. You and your crew are still alive to talk about it; and, who knows, maybe if things work out, you can return to your last swim position some day and attempt to finish what you started. Doesn’t matter, it is what it is – a valiant attempt. And I’m sure all of your followers and sponsors are in complete agreement. Well done Ben and crew. I stumbled onto this blog from the beginning of your journey and it has been a daily read before bed for my roommate and I. What a stunning feat. Thank you for the journey and good luck with your future endeavours. Safety and living to sail and swim another day is most important. Congratulations on your achievement and THANK YOU. Amazing job! So proud of the work and visibility you are bringing to the pollution and health of our oceans. I know it’s made a personal impact on me to get even better and more intentional at limiting single use plastic waste! Safety is important. I appreciate you and your crew to be shear long times in Yokohama. See you soon someday. THANK YOU for everything Ben and Team. Thank you to all the good people who surround you, your Families and Friends, your Sponsors, the team of Scientists involved in the various research projects attached to The Swim. You all have the greatest respect from many people across the globe. You are held in the highest regard for the noble intention behind this Mission. I am sure this is just the beginning of something even greater. A Movement for Change. A turning of the tide. A dawning of a new way of thinking about this world of ours and how we live in it. Thank you. Namaste! Godspeed. Thank you to all of you for what you are doing to raise awareness of the plight of our oceans, following your journey is inspiring and educational in equal measure, I have learned a great deal by following and will miss your posts, they are such a positive part of my day, congratulations to you all and for unselfishly putting safety first. Ben, what you and your team have accomplished is amazing. Thank you for bringing the message of plastic pollution and the health of the oceans to the world through The Swim project. Sustainable Coast BC magazine has enjoyed following your story. So much achieved in so little time! It’s simply amazing. Reading your post over the last 160 days has been a real joy. But more that than, it’s given me a concrete platform to raise awareness about plastic pollution at work and beyond. We’ll all miss the morning read, but definitely won’t forget all that you and your crew taught us. Go home safely! The world needs people like you back in one piece. And thank you all for being such an inspiration! Brilliant effort! You clearly made the correct decision. The impact and awareness of the expedition have inspired many. Wishing you all safe travels. Merci pour ce voyage extraordinaire et pour nous avoir fait rêver ! je penserai toujours à votre incroyable aventure en nageant dans la mer ..et en n’utilisant plus les “single plastic” ! Bien and Crew – Thank you for bringing awareness to this important environmental issue. Thank you for inspiring many of us to challenge ourselves. Safety fits, so we understand. Hopefully, the journey can continue later on. Most importantly, keep us updated on what’s next, i.e. book signings at various cities, etc… We are going to miss you and your adventure updates. Bravo pour cet exploit qui dépasse ce que l’on pouvait imaginer au départ. C’est une grande sagesse que de ne pas dépasser les limites.L’hiver dans l’hémisphère nord n’est pas tendre. La partie scientifique est d’une très grande importance, il faut toujours apporter des preuves et toi et toute l’équipe avez grandement réussis. Mahalo nui loa for The Swim and everything you have done, and are doing to help our oceans! Safety first. What you have accomplished is astounding and your courage, determination and passion are an inspiration to us all. Godspeed to Hawaii. I want to be there to greet you, your crew and Seeker when you get here. Which island will you be coming to? Each one of you deserve BIG hugs full of gratitude and warm aloha! Hope to see you soon!! Zonde Maks etc. , mooi poging! Maar wel mooi dat je snel weer terug bent! Oud en nieuw partyy! What you have done Ben is a tremendous effort. You will continue to testify and put forward your cause and I promess I will do it too. You are a great inspiration for me and I will always admire and respect you. Hope I can get in touch with you before my swim. The way you look at the ocean, it’s like you’re a part of it. It’s inspiring to do our share to protect our mother earth. Well done Ben and all the crew. This has been an exciting journey to watch. You and your team have brought the much needed attention to the ocean’s plight of plastic. Kudos on all the teamwork that has been such a success! Thanks for sharing with the whole world. Returning home safely to your families and friends must also be at the top of the goal list! Bringing critical awareness to the challenges and dangers posed by our plastic use in the way you have is admirable, and, I am much more conscientious, so can change my use of plastics. Many thanks. What is learned by the science the crew has done will have an impact, and though it isn’t as extensive as you hoped and for, that doesn’t diminish what has been accomplished. Focus on all that has been gained, including individually. High fives, thumbs up, kudos, fist bumps, and congratulations on a life changing expedition. We dream, we act, and we follow a course until life brings what it does, then we adjust and keep going. Be safe, and PLEASE keep posting until you are back home again! Your journey has changed my life and inspired me in many ways. Goals change and evolve. Each daily challenge was a “mini” goal met. Realizing the necessary pause is too a personal goal of the soul, i think. Thank you for your heroic efforts and sharing with us along the way. Looking forward to a published journal of The Swim! Thank you, Ben and crew! The story of your incomparable efforts may be forever a spark in hearts willing to commit to overcoming challenges, from personal to global. It will be always in mine. It is so hard to alter course and change expectations. 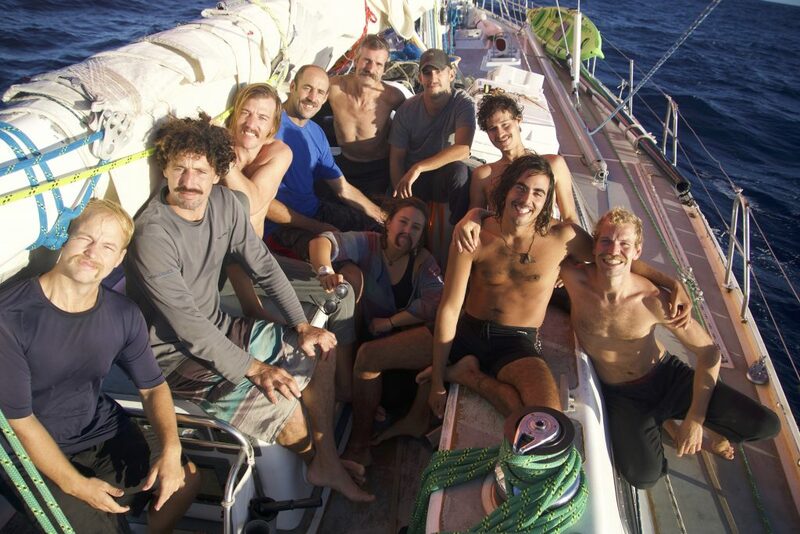 Ben, you and your crew have made a decision to stop the longest swim after facing insurmountable challenges. I have been so impressed and motivated by your efforts. Thank you for everything!